The Office of the Quartermaster-General sent a letter to U Khin Shwe last week to complain about his decision to tear down the Mayor’s Residence, a British colonial-era building on the Yangon City Heritage List. The letter came after The Irrawaddy broke the story in April. 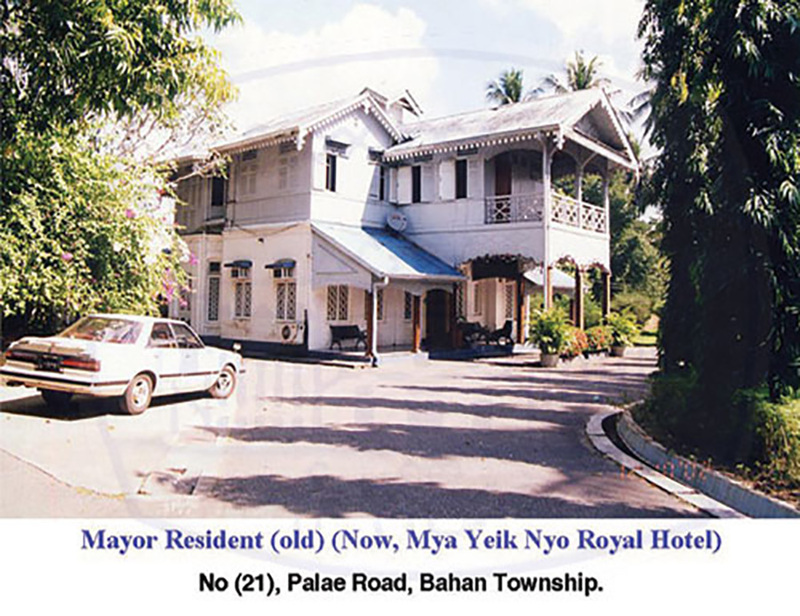 The building, located inside a 13-acre compound owned by the military that includes the defunct Myayeik Nyo Hotel, was demolished in February by the Zaykabar Company. With the China State Construction Engineering Corporation Ltd as contractor, the company plans to fill the site with 12 buildings ranging in height from 382 to 412 feet. Company chairman U Khin Shwe confirmed the letter to The Irrawaddy on Tuesday. “They told me to rebuild the building. I have to do what they asked,” he said. As its name suggests, the Mayor’s Residence was once home to Yangon’s mayors. Its last resident was U Aung Thein Lin in the early 2000s. In 1996 the Yangon City Development Committee (YCDC) began surveying the city’s old buildings to draw up a list of those with heritage value. As of 2001 the list included 188 structures, mostly religious and British colonial-era buildings. To make the cut they had to be architecturally significant, more than 50 years old and not under private ownership. The demolished residence was on the list along with the Mayor’s Guest House, another British colonial-era building in the same compound. According to Yangon Heritage Trust, an NGO that promotes heritage protection, the project area was known as Mount Pleasant during British rule. Many mansions of high-ranking officials including the Mayor’s Residence, the Mayor’s Guest House and the residence of the manager of Chartered Bank were located there. Judging by their design, the trust estimates that the Mayor’s Residence and Guest House were built before 1920. But U Khin Shwe has repeatedly insisted that the residence was no longer a heritage building because it had been through several major renovations. “The roof and floor were replaced in the early 2000s. It was heavily damaged during Cyclone Nargis in 2008. So we renovated the entire building. That’s why it is no longer a heritage building,” he said. Apart from the complaint about the building, the project has come under criticism from neighborhood residents who fear that construction could damages the 92-year-old water reservoir nearby. If it fails, the low-lying Kokkine Avenue area would be flooded and many townships would suffer water shortages. To prevent damage to the reservoir, the YCDC has instructed the developer to carry out certain safety measures.